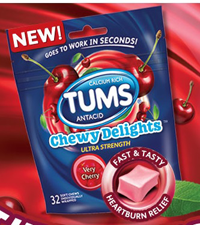 Hurry and get a FREE Tums Chewy Delights Sample! Just "like" Tums on Facebook and fill out the form! Requests subject to verification. Upon verification you will receive a confirmation. LIMIT ONE REQUEST PER HOUSEHOLD AND PER FACEBOOK ACCOUNT. ALLOW 4 TO 6 WEEKS FOR SHIPMENT. Duplicate requests will constitute fraud. Offer good in USA only, its territories and military addresses.